PRESS PLAY and let me know what you think!! Apply Eye Base all over the lid with the primer brush. Outline the crease using Native eyeshadow and darken the outer crease with Truffle eyeshadow. Blend out the edges with a clean fully brush. Darken the outer corner and lower lash line with Raven eyeshadow on a detailing brush. Use a flat concealer brush to apply Gold Rush eyeshadow to the inner half of the lid. Clean off the same brush and apply Crystal Blue eyeshadow to the outer half of the lid and center of the lower lash line. 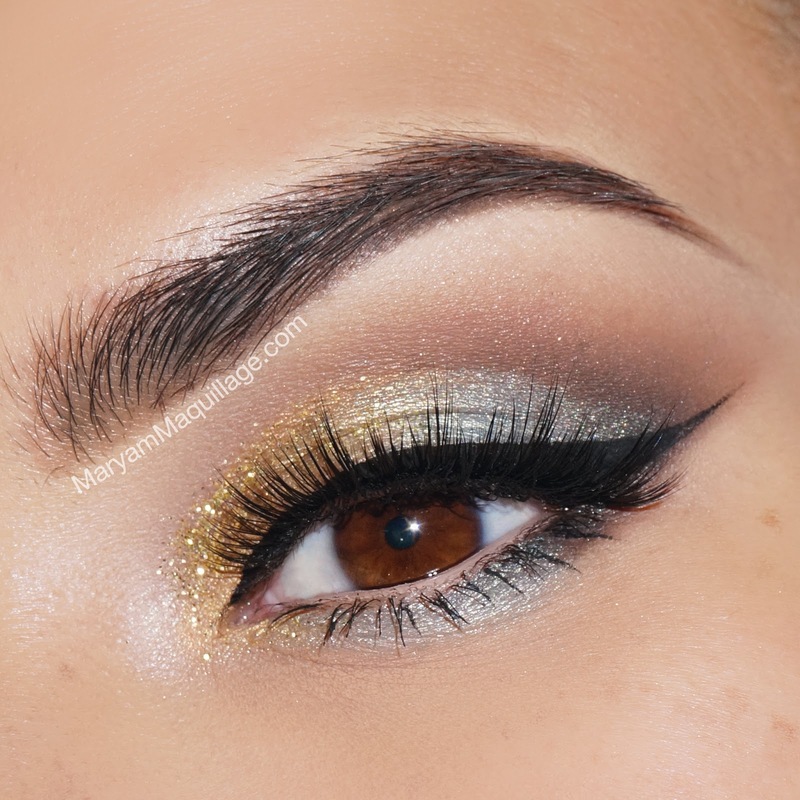 Mix Glitter Adhesive & Pot of Gold glitter and apply over the gold eyeshadow. Line the top lash line with Liquid Liner and apply falsies to complete the look. OOTD: Keepin' it cool in bluesy neutrals, I went with a casual floral tank / high-wasted distressed shorts and added a few Boho accessories like a braided belt and closed-toe sandals. Maryam, I absolutely love the color combinations of this look. It reminds me of a starry night. I wish I had makeup skills like you to be able to do this! So beautiful tutorial and video! What the camera do you use for taking pictures? Thank you. Марьям,спасибо за ваши интересные почты! Читаю Вас уже года три.Есть одно большое пожелание ,если это возможно: очень интересно узнать о вашей диете,о Вашей фитнес программе,о вашем уходе за телом.У вас просто потрясающая фигура! пожалуйста,поделитесь этим опытом в Ваших постах.Мало у кого из блоггеров есть такая фигура ,прошу Вас сделайте такой пост! С уважением к Вам и большим приветом с Вашей Родины! Love the pop of gold! The sparkle to it just looks so stunning! LOVE this so much Maryam. Absolutely Gorgeus!